This will be a lovely cross. We had the same cross last year and produced an outstanding Filly. If you are looking for a nicely priced youngster please inquire. Special consideration for purchase in utero. Ella is a lovely 2009 KWPN mare. She has an excellent temperament and 3 lovely gaits. Ella is by UB40 out of a Freestyle mare. She stands 16.1h and has a powerful hind end. She is working through Second/Third level with plans to continue training post baby. She is due in May 2018 to Schroeder. Schroeder a world class FEI Dressage stallion. 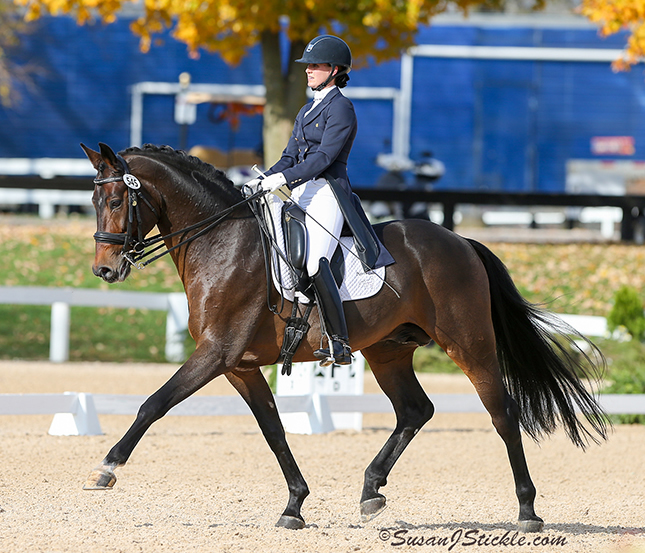 He continues to win in the dressage ring with many championships. Competing at FEI Intermediare I and moving on to Grand Prix in 2016. He is producing top offspring that are also doing well in the breed shows and dressage shows. All known to have his beautiful type, super temperament and trainability, leggy, tall and extremely athletic. Schroeder's sire Sandro Hit was Winner of 1999 6 year old Dressage World Championships and German Bundeschampionate. One of Sandro Hit's most famous daughters was Poetin (Sandro Hit/Brentano II) who was winner in 2003 of the World Championships for Young Dressage Horses as well as the Bundeschampionat. She was sold in 2003 for 2,500,000 Euros. Sandro Hit has the highest breeding index in Germany of 153. Schroeder's Dam, SPS Esmeralda was 2002 Champion mare at the Loius Wiegels Show and took 2nd place at the prestigious Ratje-Niebuhr show. The stallion Warhol by Western Star is out of the mare Wegola by Wendelin, a daughter of Gotha, Esmeralda's grandmother. He is placed up to Grand Prix Level and was licensed as a two-year-old, but was never active as a breeding stallion.